The Chamber of Commerce And Community is delighted to start our Growth Learning Series. Led by Chamber Members who are experts in their fields, we are holding these events to help people grow in their businesses and lives. We are kicking off 2019 by cleaning up and organising our spaces – both at home and in business. 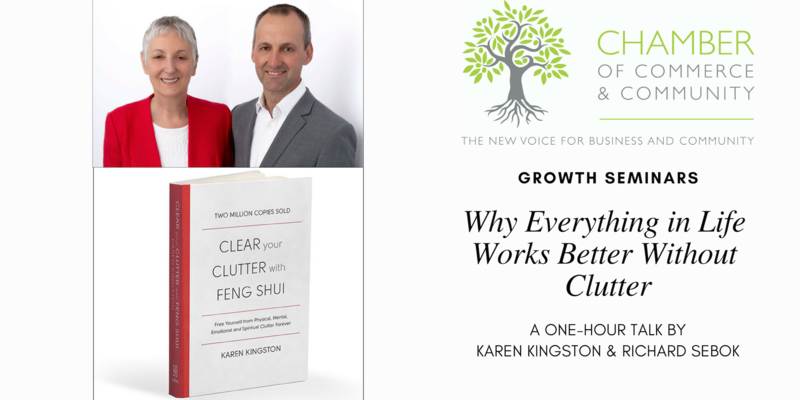 “In this talk from international expert Karen Kingston, you’ll learn why clutter is a problem at home and in your business, and how clearing it can radically help you move forward. Karen Kingston is the author of two international bestselling books with combined sales of 3 million copies in 26 languages. She and her husband, Richard Sebok, are leading experts in clutter clearing, teaching online courses, professional trainings and offering private consultations for homes and businesses through their Perth-based business, Clear Space Living. You can find more about them at www.karenkingston.com. This will be a great way to clear your year. Don’t miss it!